The most famous blue chip stocks in Europe usually take part in any of DJ STOXX indices, because they cover Europe, the Eurozone and the Eastern Europe. Sells glasses and sunglasses under its own brands (such as Ray-Ban) or licensed brands (such as Versace, Chanel and Prada). Switzerland company. The largest food company in the world, gets 21% of its revenue from Asia, Africa and Oceania and 37% from its European home market. 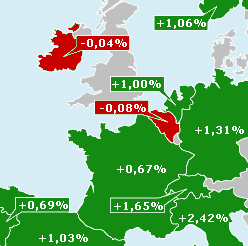 Ordered by weight in Dow Jones Euro STOXX 50 index.